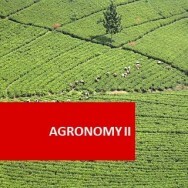 I am interested in the Advanced Diploma in Agriculture (Crops). I live in South Africa and have a Certificate in Short Term Insurance(Level 4), a Certificate in Wealth Planning(Level 5), a National Diploma in Agriculture(Level 6) and a Masters in Business Administration (MBA)(Level 8). 1. Will I be able to apply study knowledge from your diploma in the South African farming environment? 2. Will I get any credit for my existing qualifications mentioned here above? And have less subjects to take for your qualification? 3. If I enroll for the different subjects one by one and complete all, will I still qualify for the Advanced Diploma in the end? Kind regards. Your first and third questions are easy to answer, so I will deal with those first. Our courses are designed to be applicable to wherever you are in the world. Each lesson starts with background reading on the general principles and is followed by a set task or tasks, which is targeted to your own geographical area and circumstances. Your written assignments will be based on the reading and the set tasks. Therefore, you will be learning the basics, plus what is applicable to South Africa and how to apply it. You can certainly take one course at a time and still gain your Advanced Diploma, once you have completed 8 modules. Your second question is a little more difficult. From the qualifications you already have, we can look at recognition to prior learning, but I am not sure if this is right for you. It may be better for you to create your own diploma or advanced diploma, by completing courses that will compliment and enhance the skills you already have. I would advise that you look at what you already know and choose courses which cover areas you need to know about, but don't have the specialist skills for at the moment. For example, you may feel you need to do a course just on sheep, organic farming, agronomy, crop protection etc. You can bundle up all the courses that you need to complete into extended courses. 4 courses will give you an advanced certificate, 6 a diploma, 8 an advanced diploma and 12 a higher advanced diploma. 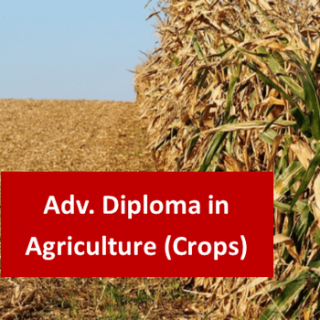 Advanced Diploma in Agriculture (Crops) course online. 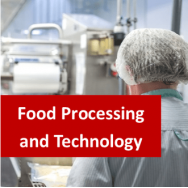 This course includes four compulsory units, plus elective, crop farming specific modules. The compulsory core modules will give you a solid foundation in Agricultural Marketing Skills, Farm Management, Irrigation and Soil Management. After you have completed the core elements, you will be able to choose 4 modules from a choice of 18 specialised courses, including: Agronomy, Berry Production, Commercial Organic Vegetable Growing, Commercial Vegetable Production, Cut Flower Production, Engineering I, Fruit Production - Temperate, Fruit Production - Warm Climate, Green Walls and Roofs, Herb Culture, Nut Production, Nut Production - Warm Climate, Organic Farming, Outdoor Crops Production, Sustainable Agriculture, Viticulture, Water Conservation & Management and Weed Control. It is more in-depth than can be found at other colleges.You'll learn more and develop skills in helping you further your business and career goals.